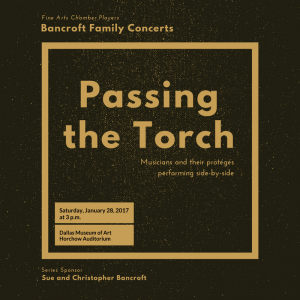 We are pleased to announce Passing the Torch, the next free Bancroft Family Concert on Saturday, January 28, 2017. This concert pairs four Dallas Symphony Orchestra musicians with four musicians who are launching their own performance careers. Held in the Horchow Auditorium at the Dallas Museum of Art (1717 N. Harwood Street, Dallas 75201), the program begins at 3 p.m. with doors opening at 2:30 p.m. The concert is FREE TO THE PUBLIC with no tickets required. Erin Hannigan, DSO principal oboe, and Nora Prener, Fort Worth Symphony Orchestra oboe; Gregory Raden, DSO principal clarinet, and Sarah Demy, Midland-Odessa Symphony and Las Colinas Symphony clarinet; Haley Hoops, DSO french horn, and Katie Wolber, Dallas Opera horn; and retired DSO principal bassoon Wilfred Roberts and John Searcy, graduate of Southern Methodist University and the Yale School of Music, come together to play Franz Joseph Haydn’s Octet in F Major and Wolfgang Amadeus Mozart’s Serenade No. 12 in c minor, KV 388. Online applications are now available for Dallas ISD student musicians who are current students or alumni of the Fine Arts Chamber Players’ free music education programs, or who are graduating seniors or alumni of Booker T. Washington High School for the Performing and Visual Arts (BTWHSPVA). Longtime FACP supporters Don and Norma Stone made a $500,000 gift in June 2016 endowing the Rogene Russell Scholarship Fund to provide college scholarships for the recipients to pursue degrees in music. 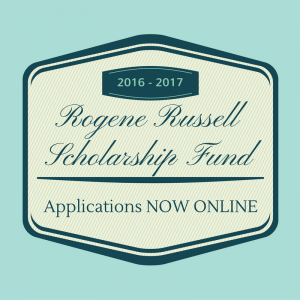 Established at the Dallas Foundation, the Fund is named in honor of Rogene Russell, the artistic director and co-founder of FACP. Applications are available at DallasFoundation.org under “For Students” and are due February 3, 2017. FACP has selected a committee to review applications and award scholarship funds in early 2017. The committee is composed of representatives from FACP, Southern Methodist University, the Dallas Symphony Orchestra, BTWHSPVA, the Dallas Foundation, and the local philanthropic community. Over the past few months, Mr. and Mrs. Stone have also helped secure additional contributions for the Fund from other arts education supporters across Dallas. The Fund now exceeds $620,000 in scholarship money. Ms. Russell founded FACP in 1981, and for nearly four decades has dedicated herself to organizing free chamber music concerts and free in-school music education for hundreds of thousands of North Texas residents. We hope you enjoy our new series we’re launching – Teacher Profiles! With our free concerts, our community of supporters can get to know the performers we have on stage, but there has not been an opportunity to meet our dedicated and talented Teaching Artists who work with our music education programs. This fun Q&A is chance to introduce you to them! Let’s meet Alfrelynn Roberts. This is Ms. Roberts’ second year teaching voice lessons for FACP at DISD’s Carter High School, and her second year at Booker T. Washington High School for the Performing and Visual Arts. 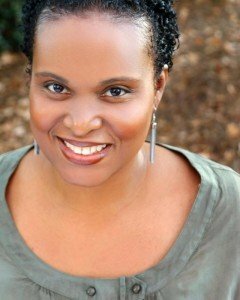 A trained operatic soprano, she received her Bachelor of Arts in voice performance from Hampton University, and her Masters of Music from Northwestern University. Who is your favorite composer to sing? That varies from time to time. It depends on what kind of mood I’m in. For classical, my favorite has got to be Puccini. When listening to music – when I’m in a jazzy kind of mood – I like to listen to Sarah Vaughan. In my car right now, I’m listening to a neo-soul artist named Avery Sunshine. What do you love about teaching high school students? When the lightbulb goes off – when they get the concept I have been trying to teach them, and they finally hear what I’ve been hearing. It’s when they can grasp new things about their voices and hear what their voices can do. Have you taught other ages? Yes, I have taught younger students in middle school, and I have taught at the college level. I was an adjunct professor at Cornerstone University in Michigan and at Kalamazoo College. What is a particularly memorable recital of yours? Oh, I’ve got one! At Kalamazoo College, we were under a tornado watch and the sirens went off when I was in the middle of a song. My teacher came on stage while I was singing, and I thought, ‘What is he doing? Is he going to sing a duet with me?’ but he announced we had to evacuate. So we took the recital to the basement. What piece of advice would you give 16-year-old Alfrelynn? Ooh! That’s a good question. At 16, I didn’t quite know what the possibilities of what an opera career could be, so I was hesitant about it. But, I loved to sing and study voice. I would tell my younger self: don’t get discouraged – just keep singing. And have fun! I was too serious as a kid. What’s your favorite sound (musical or non-musical)? Least favorite? My favorite sound would be rain, softly falling. My least favorite sound? I’d say my least favorite genre of music is punk rock. I just can’t find the music in it! Once you leave this world and reach the pearly gates, what celestial concert are you looking forward to? I think it would have to be a concert of some of the folks who have left the world too soon. My high school choral director, Michael Terrell, had a beautiful falsetto voice – a voice you just don’t hear much of anymore – and I would like to hear him sing again. There are composers, too – Glenn Burleigh and Moses Hogan – whose work I would love to hear sung by a heavenly chorus.